Persistant tearing is an aggravating problem that can cause problems with vision or even result in infection. Tearing can have different causes including problems with the eyelid or the tear drain. Tear drainage surgery, or DCR, is very effective in most cases and can be performed in an outpatient setting. 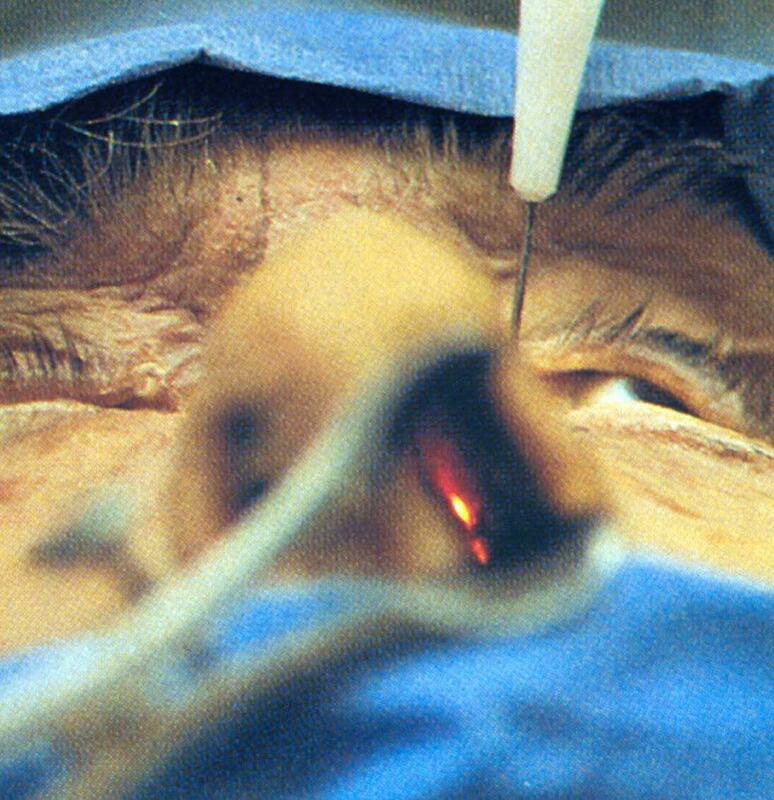 Nasolacrimal duct obstruction is treated with surgery to bypass the blocked portion of the system. The name of this surgery is Dacryocystorhinostomy or DCR for short. In this surgery, the blocked tear drainage system is bypassed to allows tears to exit the eye and prevent tears from rolling down the cheek. Your surgeon will carefully evaluate the cause of your tearing and may perform tests to evaluate the presence of dry eye, a loose lower eyelid, or a blocked tear drain. Based on this examination, our doctors will provide options for improvement in symptoms. DCR surgery is typically performed in an outpatient setting under anesthesia. The surgery itself typically takes less than an hour and is not painful. After surgery, in most cases, a silicone stent tube will be placed in the new tear drainage system. This stent tube is typically painless, does not usually cause any irritation or discomfort, nor does it interfere with vision. The stent tube is removed in the office, typically 3 months after surgery. The removal is easy and typically painless. Patients will be provided with complete post operative insturctions; however, the care after DCR is fairly simple. Most patients will receive a prescription for eyedrops and nasal spray to use for a period of time after surgery. Most patients will be seen 5-7 days after surgery for a post operative visit. Tear drainage surgery/DCR has a low rate of complications. Infection is very rare, but possible. Some nasal bleeding can occur for 1-3 days after surgery but is usually minimal. As with any surgery, scarring is possible; however, the skin wound typically heals well. In some patients, tearing will persist despite successfully surgery. In these uncommon cases, your surgeon will work with you to find a solution for your tearing. Not all patients are ideal candidates for endoscopic surgery—your surgeon will be able to determine if you are a good candidate. In patients where a blockage in the tear drainage system is identified, dacrycoystorhinostomy (DCR) is often the best solution. Endoscopic DCR offers these patients a minimally invasive means of correction that does not require a skin incision. A tiny camera is used to perform the entire surgery from inside the nose, often resulting in more rapid healing. Not all patients are ideal candidates for endoscopic surgery, for example some patients with a deviated septum or prior nasal trauma are better served with traditional DCR rather than endoscopic surgery. Your surgeon will be able to work with you to find the best option. Your surgeon will carefully evaluate your tear drainage system and nasal anatomy to determine if endoscopic surgery is right for you. Tests may be offered to determine the amount of blockage in the tear drainage system. Endoscopic DCR is performed in an outpatient setting under general anesthesia. A tiny camera is used to bypass the blocked tear drainage system from inside the nose. At the end of the surgery, a silicone stent is placed in the new tear drainage system. This stent is kept in place for 3 months in most cases. The stent is removed in the office and the process is typically painless. In some patients, some amount of tearing may persist while the stent is in place, but typically improves when the stent is removed. The surgery takes less than 1 hour and patients typically have rapid recovery from surgery. Patients will be provided with complete post operative instructions; however, the care after endoscopic DCR is fairly simple. Most patients will receive a prescription for eyedrops and nasal spray to use for a period of time after surgery. Most patients will be seen 5-7 days after surgery for a post operative visit. There are no stitches to remove since there is no skin incision. Endoscopic DCR has a low rate of complications. Infection is very rare, but possible. Some nasal bleeding can occur for 1-3 days after surgery but is usually minimal. In some patients, tearing will persist despite successfully surgery. In these uncommon cases, your surgeon will work with you to find a solution for your tearing.